L'Ancienne Forge (FeWo-direkt. De 2046245) now has a sister: Die kleine Schmiede - La Petite Forge! In the extension of the old smithy, in the spring of 2018, a separate holiday apartment for two people was built. An old wrought iron lattice surrounds the approximately 18 square meter southwest-facing terrace and leads into a light-flooded living room. Linen fabrics filter the light and give the four-meter-long canapé the view of a magnificent landscape. Warm light sources and reading lamps invite to idle hours. A staircase leads to the upper area of the apartment to the warehouse and a shower room with toilet and a separate vanity. An armchair with adjustable backrest provides for another reading / resting corner on the gallery. Our village of Saint Didier sur Arroux, located on the southern foothills of the Morvan, is a good starting point for exploring the near and far. Right from the house you are in just a few steps in nature. Guests arriving by bicycles can park in a garage 200 meters away. Endless hiking trails in the heights and expanses of the Morvan will challenge and delight you. For those interested in culture, a visit to the old Roman city of Autun (about 20 minutes) is a must. There is a market held on Wednesdays and Fridays. The way up to the cathedral leads through medieval streets. Here time seems to have stopped. Nearby, in La Boulaye, is the Temple of the Milles Buddha, one of the largest active Buddhist temples in Europe (about 15 minutes). After Cluny (about 90 minutes) with the ruins of the largest church in the West, possibly connected with a tour of the Brionnais with its Romanesque village churches. If you just want to lazy, you will find in the neighboring Thil sur Arroux a lake with shady spots. At the church square there is also a restaurant. At the lake (about 8oo meters away) there is a restaurant. Also in the neighboring Thil sur Arroux you will stop. If you want to dine at home, you can in the season (mid-June to mid-September) with the young Swiss Julien delicious dishes. He prepares it on his farm, which is about 1.5 km away, on certain days. For this he uses home-grown organic fruits and vegetables. You have the opportunity to buy organic fruits, vegetables, potatoes, herbs etc. and bread from the stone oven. Chrystelle (beauty salon in Etang sur Arroux) comes to you with its amenities and offers cosmetic treatments and classic massages on Wednesday afternoons. Please make a reservation in advance via Ana Cristina Baulan 0033 683240489. 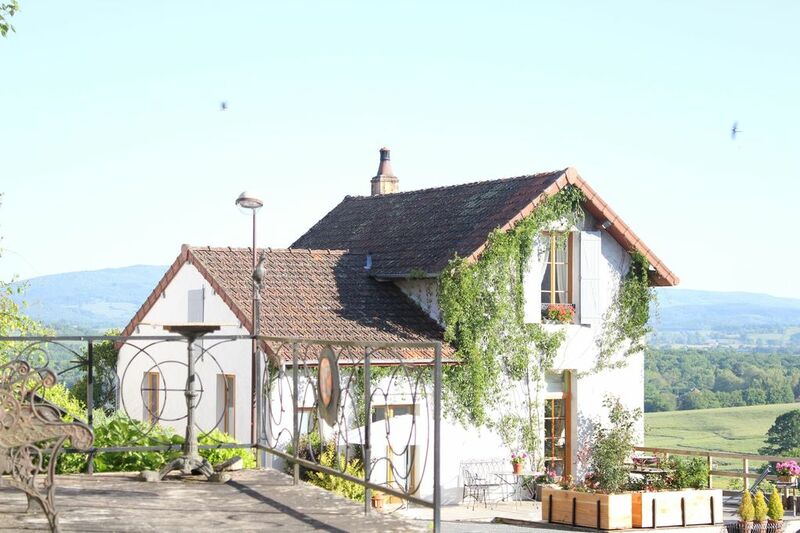 "La Petite Forge" is an apartment in the beautiful "Ancienne Forge" with magnificent views of the southern foothills of the Morvan. From here you can make beautiful walks around the village of Saint Didier Sur Arroux and the Etang de Bousson. The Morvan is a real challenge for cyclists. By car you are in 7-10 minutes in Etang Sur Arroux or in Luzy, where you will find plenty of shopping. Saint Didier Sur Arroux is the starting point for day trips to the Morvan, the ancient Roman city of Autun, the world famous wine town of Beaune, Chablis, Brionnais with its many Romanesque village churches, Cluny or Taizé.